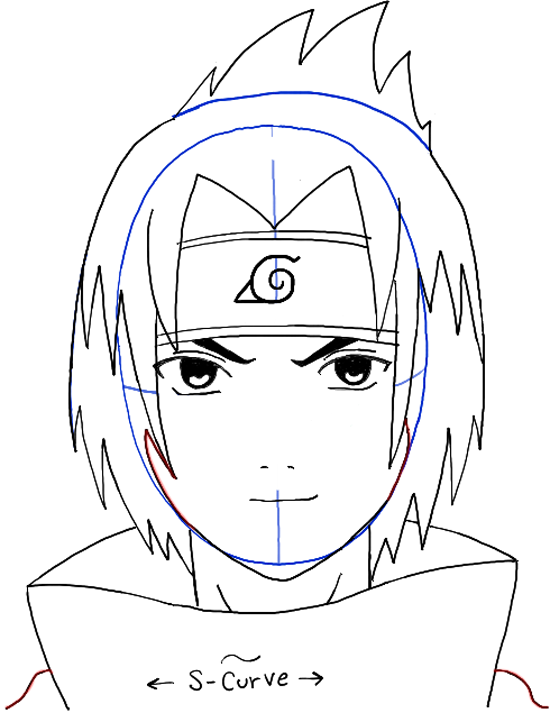 Today I will show you how to draw Sasuke Uchiha from Naturot. He is a member of the Konohagakure’s Uchiha group…which is saying something since there aren’t many left. Sasuke becomes a shinobi to try to avenge the killing of his family. 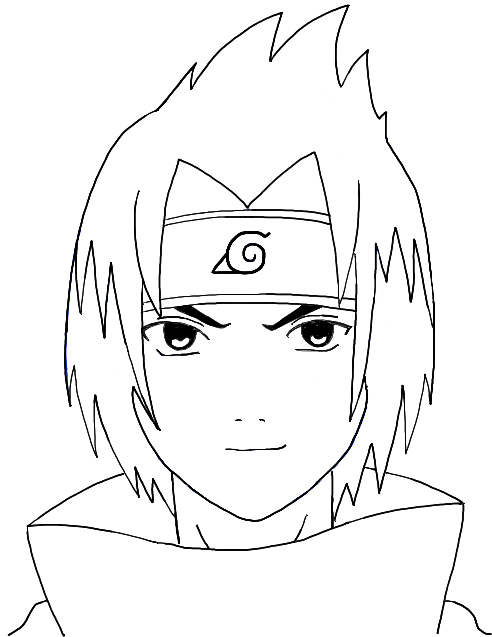 But if you are interested in drawing Sasuke, you already know all this. 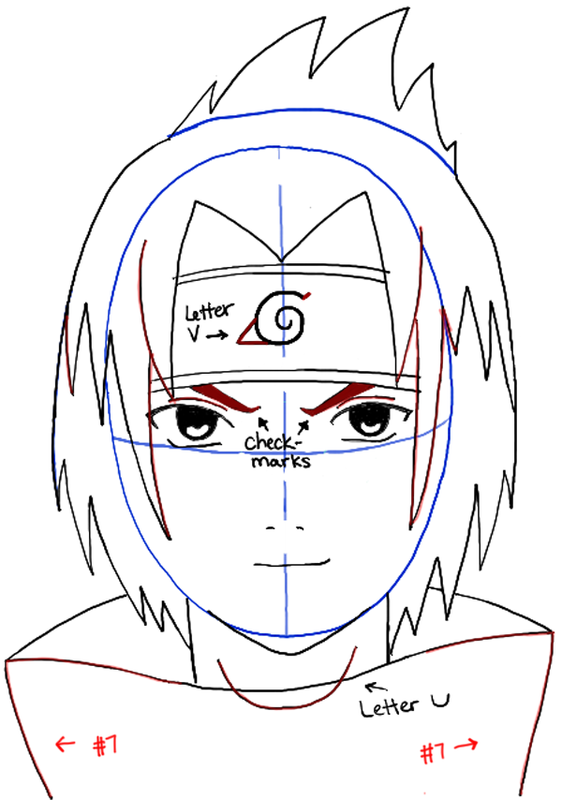 This drawing lesson will guide you thru the steps to drawing this Naruto character. Find it below. 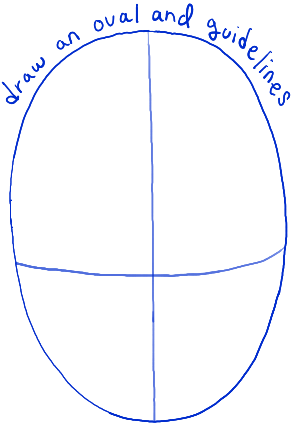 Draw an oval and then draw guidelines thru it. 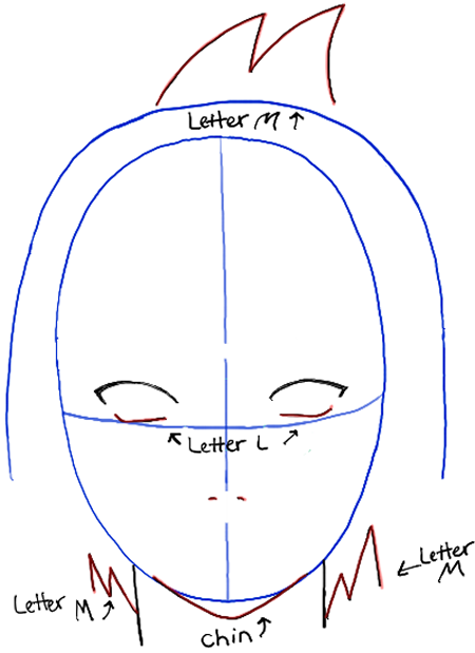 – Draw hair guideline above the oval. 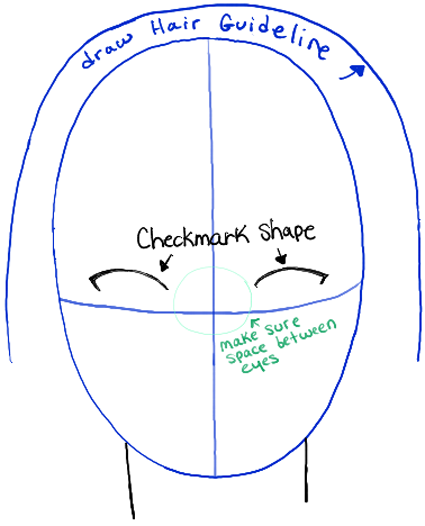 – Draw curved checkmarks for the eyes…make sure that there is enough space in between (about an eye-width’s space). – Draw 2 lines for the neck. – Draw sideways letter ‘L’ shapes for the bottoms of the eyes. – Draw 2 curved lines for nostrils. – Draw letter ‘M’ shaped hairs. – Draw a circle in each eye. Draw a jellybean shape in each eye. – Draw letter ‘M’ and ‘V’ shaped hairs. – Draw a line for the mouth. – Fill in the eye with black. 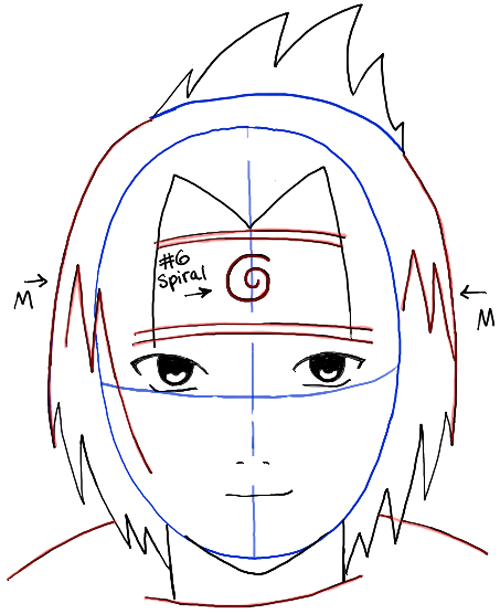 – Draw a #6-like spiral on the headband. 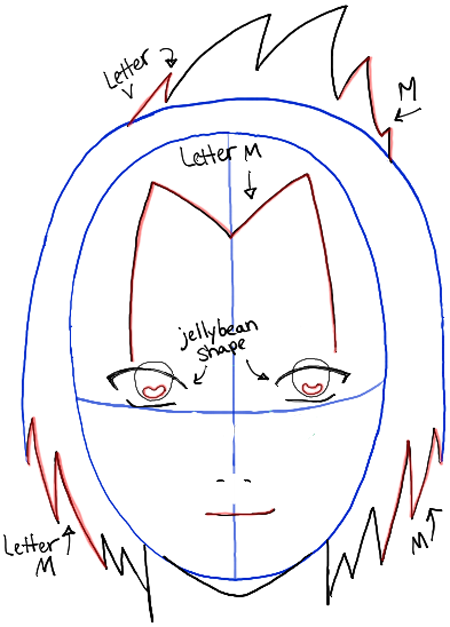 – Draw 4 curved lines above the eyes for the headband. – Draw a curved line under the neck…and for shoulders. – Daren the outline of the hair. – Draw check mark-like shapes for eye brows. – Draw a sideways letter ‘V’ shape on the #6-spiral shape. Also draw a little line on the right side of the spiral. – Draw #7-like shape on both sides of shirt. – Draw a letter ‘U’ shape in the shirt. – Draw finishing details of the hair. – Draw an ‘s’-like curve on both sides of the shirt. – Draw a curved line on both sides of the face. – Erase any remaining guidelines and darken the lines that remain. I hope that your Sasuke drawing turned out really well…come back for more Naruto / Manga / and other types of drawing lessons. 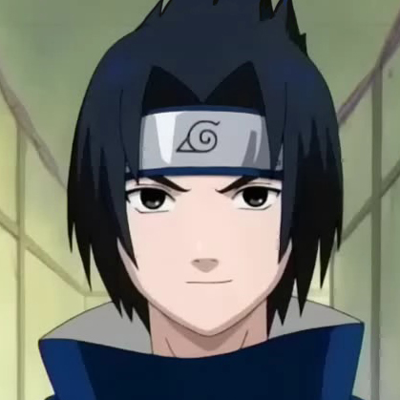 Nice , I love Sasuke. Thank you so so much! He’s my fav character and now I know how to draw him! Thank you, senpai! thank you so mush !!!!!! seriously guys. It’s Sasuke come on literally who would ever think that y’all. This article was written on 11 May 2014, and is filled under Naruto.